Skin Protecting washing gloves are perfect for keeping yourself protected while washing dogs or cats. 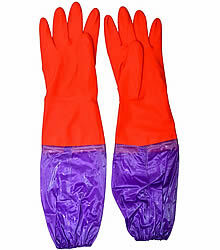 These waterproof gloves stretch all the way to the elbow to protect your skin while you are washing the animals. Great for applying flea and tick shampoo as well as it protects your hands. Keeps your hands and arms dry and protected. One size glove fits most hands.